My experience getting started with WebRTC can be summarised in a three letter acronym so I decided to write this article dedicated to answering my many questions. I’ve always said, if you don’t know an acronym, it’s probably a networking protocol. What is an Offer/Answer and Signal Channel? Unfortunately WebRTC can’t create connections without some sort of server in the middle. We call this the Signal Channel. It’s any sort of channel of communication to exchange information before setting up a connection, whether by email, post card or a carrier pigeon… it’s up to you. The information we need to exchange is the Offer and Answer which just contains the SDP mentioned above. Peer A who will be the initiator of the connection, will create an Offer. They will then send this offer to Peer B using the chosen signal channel. Peer B will receive the Offer from the signal channel and create an Answer. They will then send this back to Peer A along the signal channel. 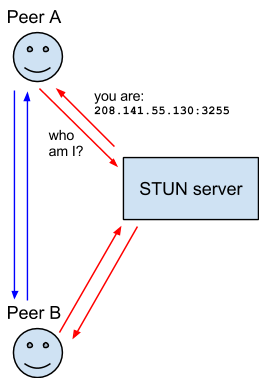 As well as exchanging information about the media (discussed above in Offer/Answer and SDP), peers must exchange information about the network connection. 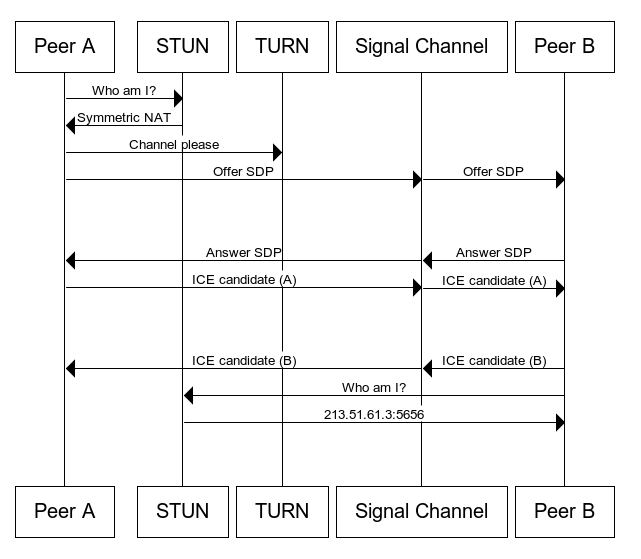 This is know as an ICE candidate and details the available methods the peer is able to communicate (directly or through a TURN server). I am a Partner Engineer for Mozilla, maintainer of Gamedev Weekly and creator of the CraftyJS game engine, based in Brisbane Australia. Really clear, so really useful. I have to ask – why have we got ourselves into this state? It is not just the tcp/ip protocols that give us an internet where the number of devices may vastly exceed the limited address space. It is also the ridiculous over-profusion of checks and blocks in firewalls and cisco routers. 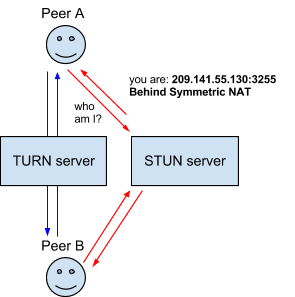 We still need to develop a simple parallel set of protocols to permit server-less peer2peer connections. Anyone with me on this? 100% agree with you Chris. Despite the security issues to consider, i do share your thought about by a simple P2P protocol (maybe including a handshake based on any type of credentials), should make the life more aesy. Chris, there is nothing ridiculous about the checks and blocks in firewalls and routers. I’m sorry that you consider security to be inconvenient. However, it is ridiculous to remove security just for the sake of convenience. Indeed, security is why I’d prefer to not have WebRTC enabled by default. Luckily, I found the not-so-easy method of disabling it in Firefox 23. Sadly, the vast majority of the users don’t even know it exists, much less enabled. No, I’m not with you on this one bit. This is the main reason I have not implemented a WebRTC teleconferencing solution. These acronyms scared me away. Any timeline for WebRTC support on Firefox OS?